The photograph shows the body of a little boy, about three years old, cradled in the arms of a Turkish officer after his body was found face down in the sand near Bodrum, Turkey, one of 12 immigrants who drowned while trying to flee from their town of Kotani in northern Syria. This photo is all over the internet, at the top of the trending list. It's also in yesterday's New York Times, although in small size in black and white on an inside page -- page A11 in my edition -- with the caption "A Turkish gendarme on Wednesday carried the body of a child who drowned en route to the Greek Island of Kos." First this photo became viral on the internet, shared everywhere, eliciting worldwide demands for aid to these families who are risking death and all their life's savings to get out of Syria, Iraq or Afghanistan, to reach Europe and safety. Seventy immigrants were found stuffed into a truck in Austria, suffocated by ruthless smugglers who abandoned the decomposing bodies and fled. Days ago we read about that and were appalled, but it had only a fraction of the impact of the photo of one little boy found dead on a beach in Turkey. The second wave of attention to the photo was an internet flood of protests -- "Leave the dead their dignity!" people wrote, "Show some respect! Don't show me this photo again!" I found this outburst of protest to be heartless and stupid. This is what photographs are for, people! To put a face to suffering and injustice and to motivate us, the viewers, to do something about it. Photographs, in their immediacy, have the ability to hit us in the gut far more than any collection of words, no matter how eloquent. That's why, since the beginning of photography in 1839, photographs have been used to touch people's emotions and sway their opinions. Even before the Civil War, Abolitionists were using photographs like "The Scourged Back" to raise anti-slavery emotion. And the pro-slavery factions did the same; witness the infamous daguerreotypes of stripped and humiliated slaves ordered by the country's leading scientist, Louis Agassiz, to promote his theory that blacks were a separate and inferior species. Think about the famous photograph by Nick Ut of the little girl running from the napalm during the massacre at My Lai. The New York Times debated putting this photo on the front page -- after all, the little girl was naked and screaming and on fire. But the editors had the grit to feature it prominently on page one. I remember, in 1972, picking up the paper from the mat and saying to my husband, "This photograph is going to win the Pulitzer prize." And it did. When President Nixon saw the photo of the "Napalm girl" of My Lai, he wondered aloud if it had been faked. But it was very real. The little girl in the photo, Kim Phuc, lived to grow up, defected to become a Canadian citizen, and founded the Kim Phuc Foundation which offers medical and psychological assistance to child victims of war, including Ali Abbas, a boy who lost both arms in Baghdad during the invasion of Iraq in 2003. The photo of the "Napalm girl" that The New York Times dared to put on its front page electrified the world to the reality of what happened at My Lai and ultimately did some good for humanity, leading to her humanitarian foundation. 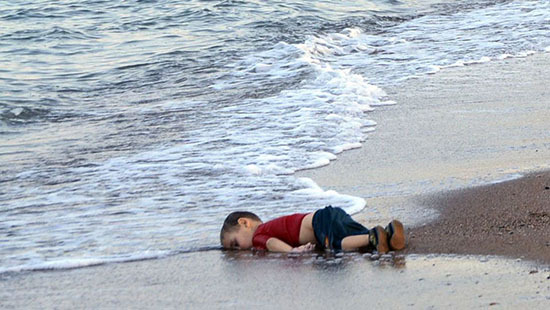 There won't be any happy ending for the little boy on the beach in Turkey. 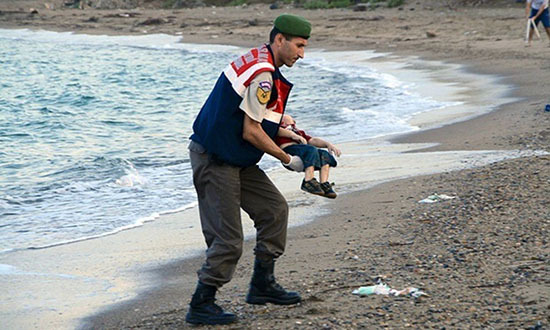 His name was Aylan Kurdi. He was three years old. At least 12 people drowned when his boat capsized in the night while trying to reach the Greek island of Kos. The bodies of his brother Galip, five, and his mother Rihan, 35, were found farther up the beach. The original photo I saw of the boy's body being carried by the Turkish police officer did not show his face, but later, on line, I saw a photo of the little boy sprawled in the sand, in his red shirt and blue shorts and smart new shoes, as if dressed for the first day of preschool. I could see his face. That's when I couldn't hold back the tears. "Leave the dead their dignity. Show some respect!" cry those who don't want to see such images, but photos like these give the dead and the abused back their dignity, especially if the reaction to such disturbing images can alleviate the conditions that caused these deaths.